Random House Trade Paperbacks, 9780812980684, 336pp. 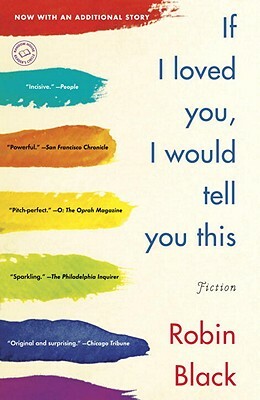 The title of this book is If I Loved You, I Would Tell You This. What are some instances in the stories of people deciding which secrets to tell and which to keep? What goes into these decisions? For example, in “Immortalizing John Parker,” why does Clara finally tell Harold about her affair? In “Tableau Vivant,” why does Jean hide her stroke from her family? What are impacts of these choices? Several of the stories are about women in their sixties or seventies. Clara in Immortalizing John Parker, Jean in Tableau Vivant, and Kate Rodgers in The History of the World are all dealing with the absence – or impending absence - of a long time partner, but each of their situations is very different. We’re told that Kate would have preferred losing her husband to death than to another woman. What do you think Clara and Jean would say about that? What kind of conversation might these three women have? The book depicts more than a dozen marriages—some successful, others not. Which of the couples seem happy to you, and which do not? Do the stories share a common message about what makes for a happy marriage, or does it seem to be more unpredictable than that? Every one of these stories is about a loss of some kind, yet there are almost no scenes in which anyone cries. Why do you suppose that is? With what other actions does Black demonstrate grief? Did you identify with the ways in which one or more of her characters experienced loss? Discuss. These ten stories were written over an eight year period. Do you have any guesses about which were written earliest and which most recently? What makes you think so? What do you think happens to the characters in the minutes and days after the stories end? For example, near the end of “The Guide,” Jack learns that Lila knows exactly what’s going on with her parents, but the story is over before they have a chance to talk about it—or not talk about it. What do you imagine their ride home will be like? And in “Pine,” what happens next between Claire and Kevin? If she wants another chance at a romance with him, will he risk it? Should he? Black pays a lot of attention to the houses in which these stories unfold. Why do you think she describes them in such detail? What do the houses tell you about the different characters who occupy them? None of the characters in this book are painted as entirely virtuous. It seems like everyone has made their share of mistakes along the way. Are any characters made out to be all bad? Which of them would you want to share a meal with? What would you ask them, if you could? Which would you rather not meet? There are some pretty upsetting situations in these stories, yet the characters don’t seem to have lost their ability to hope. What kinds of things keep them going? In “Immortalizing John Parker,” why does Clara decide to paint the portrait as Katherine Parker wants her to? In “Tableau Vivant,” why does Jean keep the bare root roses that she forgot to cancel? In “Harriet Elliot” why does the narrator feel “something like belief” on her last day at school? Discuss what you think this collection suggests about the capacity in people to survive loss.